View a traditional grafting demonstrations by Alton Lefebvre of Gulfport, Mississippi. Mississippi Gulf Coast Camellia Society grafting demonstration. 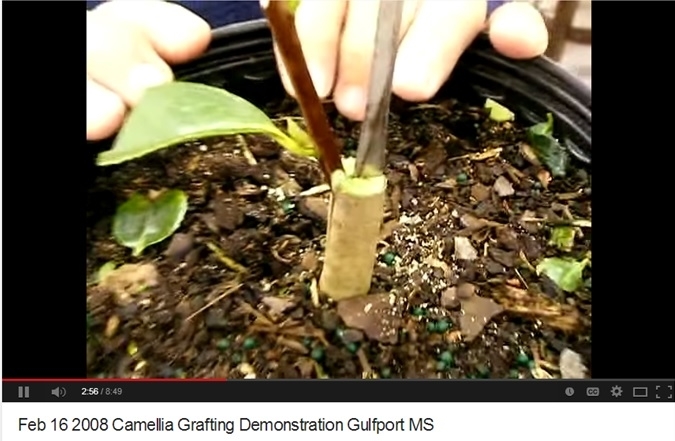 The videos were made at the Mississippi Gulf Coast Camellia Society's February 2008 camellia grafting workshop which is held annually in Gulfport. The first video shows a graft made in mid February that is then placed under a large Styrofoam cup that serves as a micro-green house while the graft callus heals. Typically around April 15 new growth will be far enough along to begin tearing away the top of the Styrofoam cup and acclimating the graft. The second video gives an update on the grafting 2 1/2 months after the grafting was preformed.